Santosha’s Combined Level 1 & 2, 500-hour yoga teacher training certification course is a unique opportunity to complete both of our comprehensive yoga teacher trainings at once, in two back-to-back courses. Our Level 1 course is designed to provide a comprehensive foundation for teaching yoga skillfully with compassion and awareness, while the Level 2 training then allows you to take your foundational knowledge to the next level. What if you had a chance to seize an opportunity that could change your life forever? Our Level 1 course is designed to provide a solid foundation for teaching yoga skillfully with compassion and awareness. The Level 2 training then allows you to take your foundational knowledge to the next level, to help you achieve praadhiita (‘advanced in studies’). This course is a wonderful opportunity to develop not only as a yoga teacher, but also as a human being embodying yogic principles in your everyday life. Our teacher training method concentrates on a creative fusion of yoga poses, woven together by a unique blend of vinyasa flows accessible to all levels and abilities. The yoga taught is not another ‘style’ of Yoga but an authentic, integrated presentation of the whole spectrum of the ancient yoga teachings, drawing from the Sri T Krishnamacharya lineage. Our in-depth training experience guides students to become ethical teachers, embracing life with awareness and acceptance of oneself, and recognising oneness with and reverence for the earth. Combining the wisdom of traditional yoga with contemporary understandings of the body, emotions and spirituality serves as a platform for self-inquiry to ignite a process of genuine transformation. This course is a fulfilling and life-changing journey both for those who wish to teach yoga as a career and those who are ready to embark on a personal journey of self-enquiry. For those who wish to teach, the yoga training will provide the student with the confidence needed to teach yoga skillfully, with compassion, awareness and knowledge. For all students, this training provides an incredible opportunity to be with like-minded people, to come to know yourself like never before, to connect to your true nature, to embrace new relationships, joys, and ideas and to acquire new tools and skills that will allow you to move through life with ease. 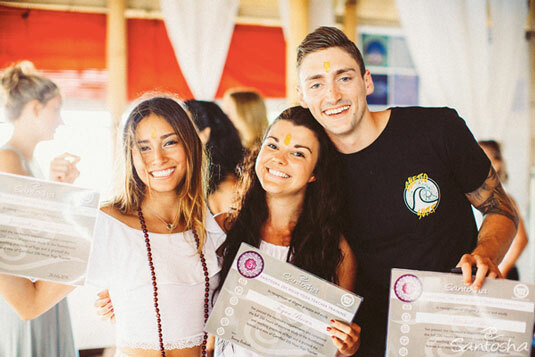 The Level 1 & 2 Combined YTT 500 is especially convenient for those students who are able to travel to Bali for two consecutive 25 day trainings, allowing them to achieve their Yoga Alliance certified 500-hour teaching certificate in one trip. Our Level 1 course is designed to provide a comprehensive foundation for teaching yoga skillfully with compassion and awareness. The Level 2 training then allows you to take your foundational knowledge to the next level, designed to help you achieve praadhiita (‘advanced in studies’). This course is a wonderful opportunity to develop not only as a yoga teacher, but also as a human being embodying yogic principles in your everyday life. Our teacher training method concentrates on a creative fusion of Classical, Ashtanga, Vinyasa Krama, and Iyengar yoga poses, woven together by a unique blend of vinyasa flows that are accessible to all levels and abilities. The yoga taught is not another ‘style’ of Yoga but an authentic, integrated presentation of the whole spectrum of the ancient yoga teachings, drawing from the Sri T Krishnamacharya lineage. Our in-depth training experience guides students to become ethical teachers, embracing life with awareness and acceptance of oneself, and recognising oneness with and reverence for the earth. 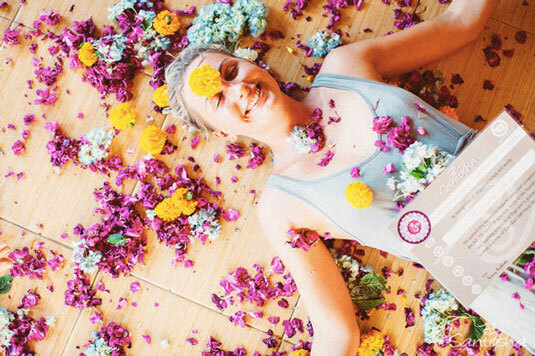 Our yoga teacher training embraces a holistic approach to the path of yoga. Combining the wisdom of traditional yoga with contemporary understandings of the body, emotions and spirituality serves as a platform for self-inquiry to ignite a process of genuine transformation. The Santosha RYT-200-hour Yoga Teacher Training allows each individual to experience the true essence of yoga through unique wisdom from the ancient scriptures and philosophy, applied in a contemporary context. We foster a learning environment in which students can fully grasp the full eight limbs of yoga and begin to put yoga into practice in their daily lives. The Art of Sequencing – How to sequence safely and effectively, to progress asanas and breath intelligently and appropriately. The Art of Safe Teaching – How to teach postures and practices safely and effectively. The Foundations of Teaching – Anatomy specific guidelines which form a solid basis for knowledgeable and informed teaching. The Full Eight Limbs of Yoga – this course goes beyond the physical (Asana) practices, allowing for a deeper experience of the healing spiritual benefits of Yoga and the Eight Limbs. Intelligent Sequencing and Design – We design and structure our teaching methodically – enabling our graduates to teach confidentially from a solid foundation. Santosha’s teachers possess deep knowledge and understanding, and their compassion and love for teaching means that they truly teach from their hearts. Together students and teachers create a sacred environment for learning and transformation: a community of like-minded individuals from around the world that support one another in living our true potential! Santosha Yoga Teacher Trainings are truly unique, and all students will feel supported, loved and accepted from the moment they begin their new journey. 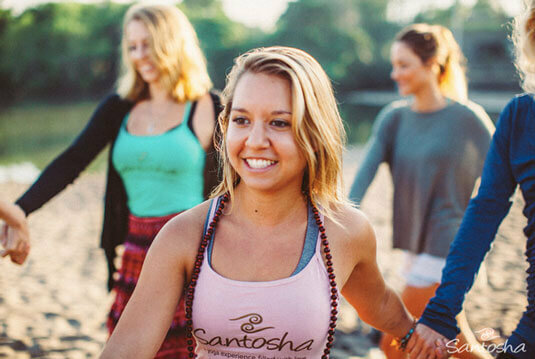 The Santosha YTT 300 hour training has practical value, including the ability to register as a Yoga Alliance RYT500 teacher, but the real purpose is to bring students deeper in their understanding of yoga (and therefore their own lives), through direct personal experience and practical knowledge. The Level 2 YTT 300 allows each individual to experience the true essence of Yoga through a unique and holistic synthesis of ageless wisdom of ancient scriptures and philosophy, applied in a contemporary context. Santosha has made me realize the exceptional, strong, intelligent woman that I am. I could have asked for no greater gift. I will carry this month with me through good times, hard times, and unencumbered joy. Thank you. "I'm sitting at the airport and all I have in my heart is love, love for all that have met and have touched my heart! Thank you all for being you, and for loving me! I want to get home and share the love that has been imparted on me! Namaste"
For me these are the greatest of gifts, difficult, beautiful, incredible changes that started during our YTT and continue to evolve, their positive influence reverberating and touching all those around me. This is the real gift of yoga. I learned more about who I am, about self created suffering , and how to accept and let go of all my stuff than I have ever learned in my entire life. My eyes are now open, I am present and am able see the deeply embedded patterns of negative thoughts and behaviours I had created that I was completely oblivious to in the past. This has enabled me to start to heal and grow positively as a person. My heart is open and I can accept myself for who I truly am. You've created a program that allows people to evolve in ways most of us would have never imagined possible. This may sound minor to some, but it is in fact huge. We learned about the body, about life and philosophy, and largely about ourselves and the strength we all carry within. I am forever grateful for your presence in this world and I feel very fortunate to have been one of your students! Upon completing this course, you will be equipped to practice safely and teach others in a range of diverse settings. This course will qualify you to become registered as a RYT-500 with the Yoga Alliance, and all Santosha graduates are offered support on their teaching journey. A combined saving of AUD $1,000 than if you booked a Santosha Level 1 and Level 2 course separately! Includes a Santosha Welcome Pack with singlet and Mala Beads. Please note – Prices include a $530 AUD non-refundable deposit to secure your place. Prices do not include flights, meals or accommodation. Many Santosha students (and teachers!) have visited this island and fallen in love with its relaxed pace, stunning beaches and breathtaking sunset views. It is the perfect place to relax and revitalise surrounded by sparkling seas, friendly faces and happy island vibes. For this very reason we are so excited to be sharing our brand new beach-side shala with our 2017 students. The open-aired Balinese designed shala offers our students afternoon sea breezes and sparkling views – and with a cafe downstairs sitting right by the ocean, you can easily fit in a swim and a delicious meal during your breaks. Snorkellers, divers, beach-lovers and surfers will love our new Bali Island home! Nusa Lembongan is a diver’s paradise with nice drifts, amazing quality corals and superb fish life. Snorkelling with Manta Rays is a must-do for any ocean lovers and can be easily arranged for your days off. Nusa Lembongan is home to some world-class waves and has surf-able waves all year round. The island has three main breaks that can be enjoyed by the beginner to the more experienced surfer. For those that prefer the view of the ocean from the shore, there is still much to offer for you as well. Hire a bicycle and explore the jungle and beaches of Nusa Lembongan and neighbouring Nusa Penida, explore Balinese temples, enjoy the many options for yoga in the area or simply find a café with a scenic view and soak up the beauty of this peaceful island. We are excited to have partnered with Monkey Surf, the island’s #1 water sports guide company, to offer Surf + Freedive packages to make the most of your days off in Nusa Lembongan. They will be offering safe and fun experiences for all levels of ability on the four designated free days during the course. We are incredibly lucky to boast an on-site cafe – Ginger & Jamu. Run by chef (and Santosha graduate) Jamie Chick, the café serves a selection of healthy, hearty meals, all created with the most important of ingredients – love! We might be biased, but we think it serves the tastiest food on the island. At Ginger & Jamu, great care goes into creating the most most-watering meals possible using the freshest ingredients available. Our chef is a yogi and expert in nutrition – he knows exactly what our busy students need to keep them healthy, happy and radiant during their time on the course. Many have begged for recipes – be nice and he might just share a few with you. Please Note – Please “Enquire Now” to receive the Accommodation Guide for this location. Our Next Combined Level 1 + 2 Training will be in 2020. Please email to be added to the waitlist for this course. We will not be holding a combined course in 2019. However our current Level 1 RYT-200 trainings do give you the skills to teach and allow to you to enroll as a RYT-200 with Yoga Alliance – enabling you to teach and share yoga worldwide. Attend our Combined Level 1 & 2 course, and in the extremely unlikely event that by lunchtime on the second day, you feel that you do not want to complete the course OR you do not want to become a Yoga Teacher, we will refund your money minus the non-refundable BUT transferable deposit fee.